← Gavin’s Photo Couch #22. The First 4×5 Exposure. 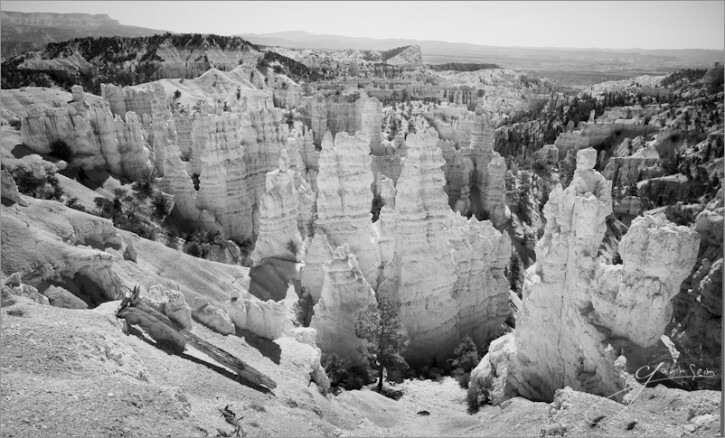 The spires of Bryce Canyon make me think of the ruins of an ancient city. They feel timeless, their detailed pattern texture glaring into my eyes as they’re struck by the light. The place is absolutely stunning. But it’s not simple. It’s vast and intricate, so bringing its sun-washed beauty into a two dimensional frame is a challenge. With this scene, the simplicity of a black and white image allowed me to focus on the study of line and tone, leaving the color we’re familiar with from the Utah red rock to be filled in from our own minds. I came into Bryce at sunrise, but I saw this scene at Fairyland Point on my way out when the sun was fairly high in the sly. The light was bright sunshine, nothing like the subtle glow of sunset or sunrise. Yet, I’ve found that sometimes with a monochromatic image, the light does not always work the same way. Not that good light becomes in any way unimportant, but it may differ. I planned a black and white image right off, but then went further, adding a Marumi 700nm infrared filter to completely alter the way the light was absorbed. The 5D MK2 has built in protection against IR light, so I believe the effect is quite different than if I had used an infrared modified body. The filter blocks nearly all visible light, and the limited sensitivity of the camera to IR light meant a long exposure. Even in bright sunlight at 200 ISO, I exposed this for 35 seconds. I’ll post the very red result below. 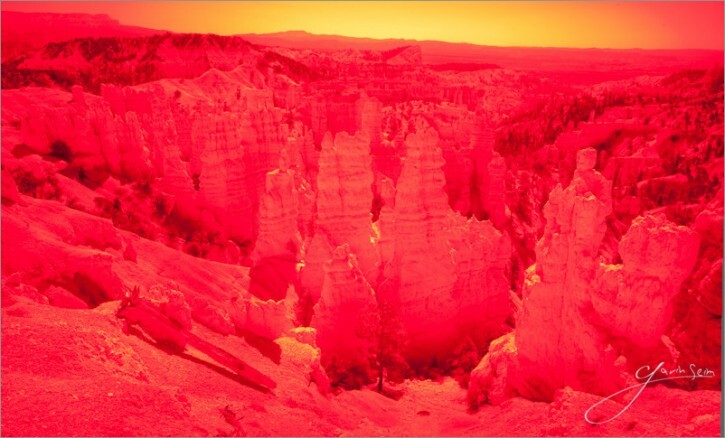 This is not the soft color infrared that we sometimes see from an infrared converted camera. When converted to black and white, however, everything changed. See the second example. My process here was intensive. In the initial conversion, the scene is very light, but no white clipping is present. The main concern for me was similar to what I deal with in many intricate or broad landscapes: keeping the scene clutter-free and simple. I used a combination of black and white settings and finally went into Photoshop to spend a good amount of time working the tone with burning and dodging. I worked very carefully around the towers, using the light that was there, but increasing and decreasing its tone and variations to control the way the eye scans the scene and makes each tower stand apart from the others. The plain image from camera using the IR filter. The initail LR processed image after presets and tweaks, but before detailed tone controll in PS. 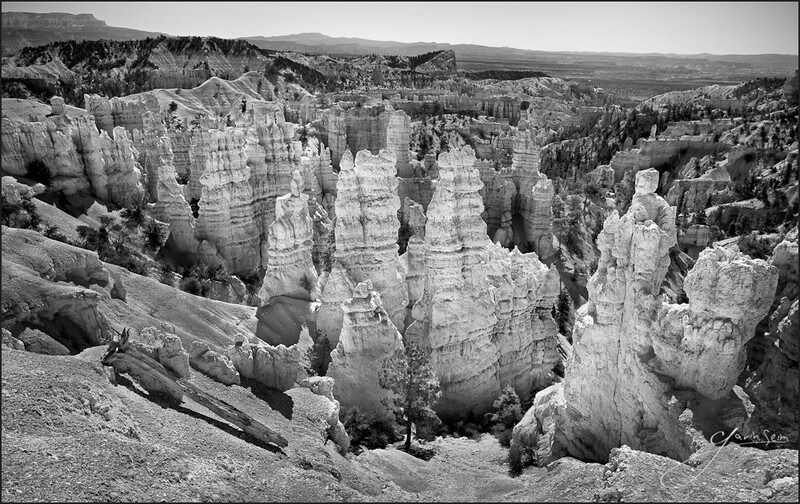 This entry was posted in f164, Fine Art, infrared, journal, nature, silver, technique, travel and tagged black, bryce, canyon, f164, infrared, national park, silver, towers, whire. Bookmark the permalink. Gorgeous image. Thanks for sharing your technique.